This elegant dessert will be music to your taste buds. A thin layer of chocolate separates luscious raspberry mousse and yellow sponge cake—a second layer on top finishes this masterpiece. Garnish with whipped cream and fresh raspberries. For Cake Layer: Preheat oven to 350°F (175°C). Grease 9-inch springform pan. Combine flour, baking powder and salt in small bowl. Beat butter and sugar in small mixer bowl until creamy. Beat in egg and vanilla extract. Alternately beat in flour mixture and milk. Spread into prepared springform pan. Bake for 15 to 20 minutes or until lightly browned. Cool completely in pan on wire rack. For Chocolate Layer: Microwave morsels and cream in medium, microwave-safe bowl on HIGH (100%) power for 1 minute; stir. Microwave at additional 10 to 20-second intervals, stirring until smooth. Cool completely. 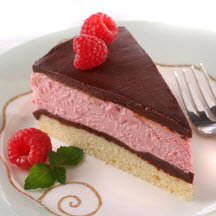 For Raspberry Mousse Layer: Combine sugar, water and cornstarch in medium saucepan; stir in raspberries. Bring mixture to a boil. Boil, stirring constantly, for 1 minute. Cool completely. Microwave baking bars and 1/2 cup cream in medium, microwave-safe bowl on MEDIUM-HIGH (70%) power for 1 minute; stir. Microwave at additional 10 to 20-second intervals, stirring until smooth. Cool completely. Stir into raspberry mixture. Beat remaining cream and vanilla extract in large mixer bowl until stiff peaks form. Fold raspberry mixture into whipped cream. To Assemble: Remove side of springform pan; dust off crumbs. Grease inside of pan; reattach side. Spread 1/2 cup chocolate mixture over cake layer; freeze for 5 minutes. Spoon raspberry mousse over chocolate; freeze for 10 minutes. Carefully spread remaining chocolate mixture over raspberry mousse. Refrigerate for at least 4 hours or until firm. Carefully remove side of springform pan. Garnish with whipped cream and raspberries. Nutritional Information Per Serving (1/12 of recipe): Calories: 540 Calories from Fat: 330 Total Fat: 37 g Saturated Fat: 24 g Cholesterol: 100 mg Sodium: 150 mg Carbohydrates: 51 g Dietary Fiber: 2 g Sugars: 36 g Protein: 4 g.